FoV distributes warm clothes and blankets among the poverty stricken people, widows and the women from the unprivileged section of the community. A total no. of 300 woollen clothes and blankets were distributed among the needy. After the direct distribution of the warm clothes at the door steps of the needy people, a ceremonial distribution programme was organised at Friends of Vrindavan’s office campus. 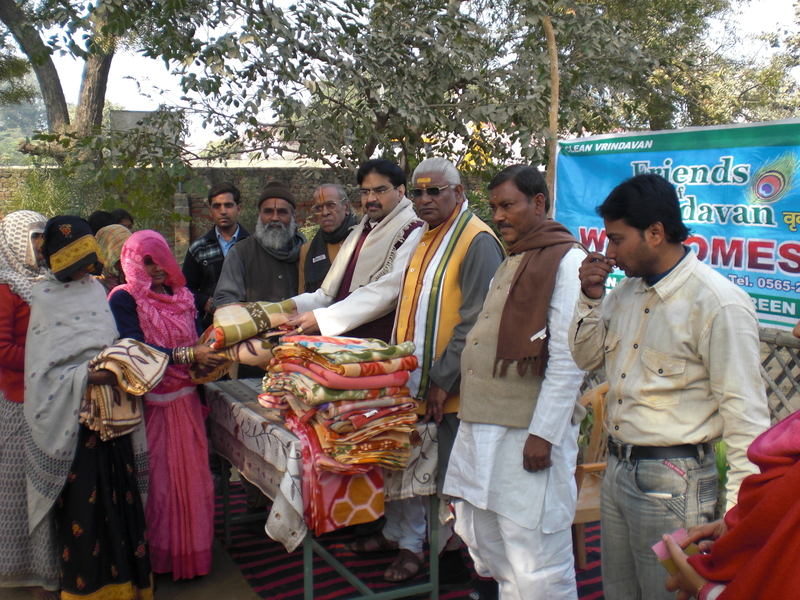 The blankets were distributed jointly by Acharya Shri Atul Krishna Goswami, Sevait of Shri Banke Bihari Temple, Pt. Bal Krishna Gautam and Pt. Bihari Lal Bashishtha from Akhil Bharatiya Brahmin Mahasabha. Shri Atul Krishna Goswami said that Vrindavan is famous internationally for it being the pilgrimage town, where the poorest of poor can come and reside with comfort. Much care is given to the poor pilgrims and the widows by the people of Vrindavan. The selfless service being provided by the organisations like Friends of Vrindavan adds to Vrindavan’s glory. Pt. Bal Krishna Gautam said that it is heartening to see FoV’s dedication to protect the environment of Vrindavan and he was impressed to see that this organisation is focussing on the welfare of the humans by distributing clothes, apart from the regular services to this Divine land. Pt. Bihari Lal Bashishtha said that he was proud to be associated with the charities of Friends of Vrindavan. He recalled his long time association with this organisation and made an appeal to the locals, visitors and all the lovers of Vrindavan should extend all their support to FoV. While convening the programme FoV’s Jagannath Poddar said the warm clothes and blanket distribution was sponsored by Shri Umesh Davda from U.K., who is an ardent devotee of Shri Dham Vrindavan. Serving the ecology, heritage and culture of pilgrimage town Braj-Vrindavan by Cleaning, Greening, Conservation activities. Table Baume&Mercier roots firmly rooted in the famous brand of traditional, the replica rolex answers to the continuation of 186 years of rich history of superb swiss replica watches technology. The celebrity tab is based on "professional rolex replica production principle of tablissage", also is the master watches R & D and manufacturing all the steps in the internal skill, and assembly of various components of the watch manufacturing process.